At any given moment, there is probably at least a dozen food storage containers sitting in my fridge. My refrigerator is packed with fresh fruit, that is cut up and placed in containers at the beginning of the week for easy snack preparation, and of course, leftovers. 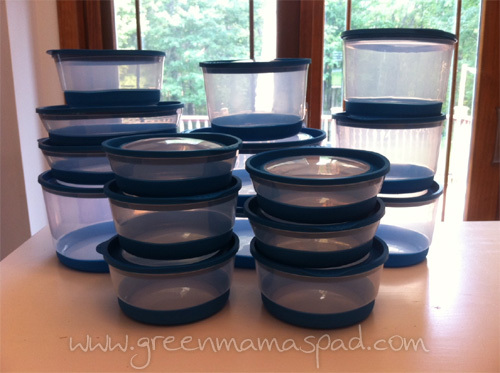 I still use plastic containers as it is just a better choice for me with 4 kids under foot and because they are more affordable for us average folk. I just make sure that they are BPA free and I don't reheat food in them, just to be safe. Farberware has a line of eco-friendly plastic food storage containers called EcoFresh that are not only BPA free, phthalate free and recyclable, but they are also biodegradable. 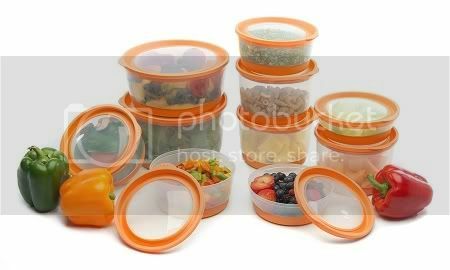 "FARBERWARE® EcoFresh food storage containers are made with EcoPure, which is a completely organic additive the promotes biodegradability without changing the structure and durability of the plastic while in use." EcoFresh has several container lines to choose from including Platinum, Silver, Eco, Classic and Canister. 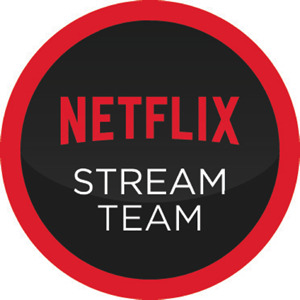 The Platinum series, which I received to review, is considered their premium series. It uses a vacuum tight inner-wall seal to keep food fresh. Instead of the traditional red and blue colors that many containers come in, these are available in four trendy colors: aqua, fern green, plum, and tangerine. Or you can even get a mix of all four colors in one set. The first detail that I really like about these is that even though there are six different container sizes, there are only two different lid sizes. I have bought food storage sets in the past where you would get three or more different lids and that just makes it so much more difficult to reach blindly into your cabinet and grab the correct lid out. The lids do press down fairly easy to create that nice seal and they come off easily as well. No prying necessary. Heading off to the fridge. My main use for these has been for fruit. 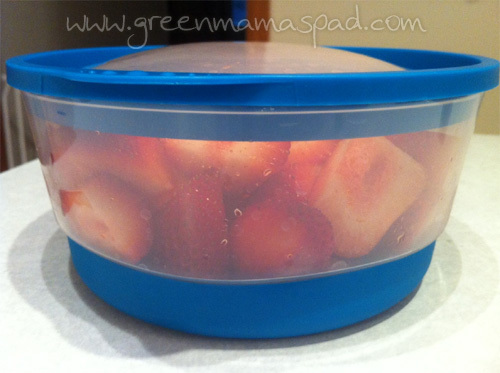 The deep containers have been great for cut up cantaloupe and strawberries. I'd like to tell you that my fruit stayed fresh longer, but have you seen four young boys eat? Midweek I am off to the grocery store again to refill our fruit supply. Fruit never lasts long enough to spoil in this house. I have also been using some of the EcoFresh containers to store dry foods in the pantry. Mainly things like crackers and snacks for the kids. The last thing anyone wants is to reach into a bag and pull out a stale cracker, or worse, a stale cracker with an ant on it. Bleh! These keep our snacks fresh and crunchy inside and keep any stray ants outside. Plus it is really nice to be able to stack the containers and make some extra room in my pantry. Again, four boys. Overall I have been extremely pleased with the Farberware EcoFresh containers. Not only do they look good, they function well and the prices are very reasonable. And I can rest a little easier knowing that there are no toxins like BPA leaching into our foods from the plastic. All of the EcoFresh container sets are currently on sale at the EcoFresh Store. The Platinum 32 piece set is $39.99 (regularly $52.99) and the Platinum 20 piece set is $29.99 (regularly $42.99). One (1) winner will receive a Platinum 20 piece set in the color of their choice. Please use the Rafflecopter entry form below. I like that it has a Air & Water Tight Vacuum Seal. randall robison.i like that they actually keep food fresh. I Like that these are BPA free and biodegradable. Love that they have the most efficient and easy to use vacuum seal while also seeking out the most eco-friendly solutions. I like that EcoPure allows microbes to break down the structure of plastics at significant levels (up to 45%) in as little as 15 days. These are awesome! I love the fact they are made in the USA and the sizes are perfect for storing foods for babies. Love that they are made with EcoPure and contain no BPA. I like that they are made with EcoPure. I like that they're toxin free also! I like the fact that they are warp resistant.The FARBERWARE® vacuum seal capability remains even after lids have been continuously used and machine-washed. I follow your blog on GFC, subscribe to your email and like you on Facebook! I would love to win this!I learned they are non-toxic, which is great! Thanks so much for the terrific giveaway! I really like that these are so eco-friendly! I like that they are recyclable and there are no nasty chemicals leaching if you use them in the microwave. BPA free is always a great thing! :) They're also easy on the eyes, for being food containers they're actually pretty cute. I also like the wide variety of sizes offered. vacuum seal without having to use any complicated sealing device. I like that it has Vacuum Freshness, Innovative vacuum-seal lid. Thanks! I like that it's Plastic... so lightweight & durable... but I L♥VE that it is BPA free AND it actually biodegrades! I like that the containers are BPA-free! I like that they are BPA free and I could really use the deep containers! I like that the containers are BPA free! I like that you can safely microwave, freeze, and wash containers without any risk of leached toxic chemicals. I like that you can use them like "normal" containers while being a "green" container. BPA free, As all plastic and food containers should be. I love that they are BPA free, you an never be too careful! I like that they are BPA free and create a vacuum seal. I LIKE THAT THE EcoFresh plastic food storage containers are BPA free, FDA approved and food safe. I like that you can safely microwave, freeze, and wash these containers without any risk of leached toxic chemicals. I like that "You can safely microwave, freeze, and wash containers without any risk of leached toxic chemicals" :) *Thanks* for the giveaway! Love that there are no nasty chemicals!! I like the innovative vacuum seal lid used in the ecofresh containers. I like everything about it, but especially that it is biodegradeble and BPA free. I liked learning so much about a new product on their site - I found this particularly interesting: "Tests have shown that as little as 1% (by gram weight) of EcoPure is needed to make a product biodegradable." I love that they are BPA free. Those are fantastic. I love the colors!! I like that they are BPA-free and safe in the microwave or freezer. I like that there are only 2 lid sizes. I hate trying to find a lid that fits. I like that they are BPA Free! I hate chemicals!! And also that they are easy to clean and reusable! and they are bpa free! 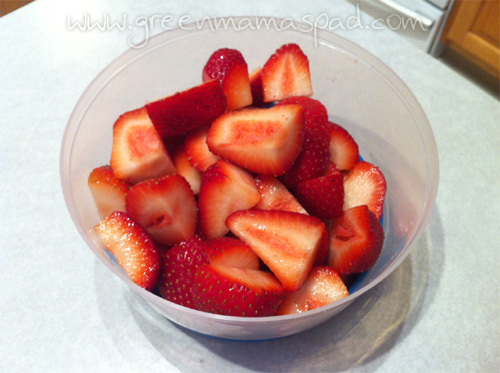 I love that they're BPA-free and able to be used in the freezer and microwave, plus are easy to clean! I love that they are designed to be warp-resistant. I love the colors but most importantly that they are will biodegrade quickly in a landfill & are safe for the recycling stream. I like that the containers are eco-friendly, have a vacuum seal, and can be used in the microwave or freezer. I like that they create a vacuum seal. I like the fact it is BPA free. Like these products. I like that it is made from eco-friendly plastic; safe to recycle & quickly biodegrades in landfills. I so like this - EcoPure makes the first containers that are biodegradable, recyclable & reusable. I like that they are biodegradeable and I love the colors! These products are amazing and I've never heard of them until now! I like that they're biodegradeable. i love that they're warp resistant and easy to clean! I like that they are food safe. I like that the lids make a vacuum seal. I learned that the ecopure part of the containers makes them actually degrade once they hit the landfill, but it doesn't affect the durability of the container while you are re-using it! I love that they are BPA free and that they have a vacuum seal - that is great to keep food freah. I like that they are microwave safe and easy on and off lids. I like they create a vacuum seal to keep your food fresh! I like that they have a vacuum seal lid. I want to know my food is fresh! I like that they are BPA free, FDA approved and food safe. BPA free, Eco-friendly, FDA approved, microwaveable, vacuum seal, what more could one want!! I like that they're stackable, to keep things tidy. Thanks for the giveaway. I like that you can safely microwave, freeze, and wash the containers. I like that they are BPA free and love the lid colors, especially the aqua. I like the 3 Canister Value Set. I love that they have a vacuum seal. I love that you can buy the set in a variety pack so that you can get all of the colors! I like they are BPA Free and the vaccum seal. I like that they can be microwaved and washed without the risk of exposure to toxic chemicals. Love that they are pba free! I love that they are BPA free and FDA approved! I like that they are safe to recycle. When they're too worn out for use, recycle them! I learned their containers use an innovative design to create a vacuum seal without having to use any complicated sealing device. This makes them easier to use & clean, and cuts down unnecessary costs. Eco Friendly plastic that save for the microwave. Sounds great to me. Our containers use an innovative design to create a vacuum seal without having to use any complicated sealing device. This makes them easier to use & clean, and cuts down unnecessary costs. I like that they come in such great colors...tangerine, plum...just gorgeous! I like all the different sizes. I like that the Eco Fresh containers are BPA free. The vacuum seal is great! My current containers are very difficult to close and especially seal! I love that they are Ecofriendly, are air tight and come in different colors. I like the fact that they are biodegradable--since they are plastic, they will eventually end up in a landfill! I like the color choices! They're fun! I like that they are BPA free so I can microwave and wash them in the dishwasher with out worrying about leeching toxins into my food. I love the colors! It'd make it easy to keep a reliable system for storing my leftovers! I like the canisters. I would rather put cereal in a canister than keep it in the box because my kids are forever forgetting to roll the bag down and then it goes stale. I like that its eco friendly plastic and BPA free. the fact they are made in the USA . I like the vacuum seal to keep food fresher. I like that they have only two different sized lids! Awesome! I liked Farberwareecofresh on FB. I like that they are BPA free and biodegradable! I like that they are safe to recycle & quickly biodegrades in landfills. I learned that Farberware is made from eco-friendly plastic; safe to recycle & quickly biodegrades in landfills. I love that the EcoFresh plastic food storage containers are BPA free, FDA approved and food safe and that I can safely microwave, freeze, and wash containers without any risk of leached toxic chemicals. Thanks for the giveaway...FARBERWARE vacuum seal capability remains even after lids have been continuously used and machine-washed. Love that they are BPA free! I like glass containers but these would be so much easier to store! I like they are BPA free.